Tesla is due to report its first quarterly profit ever, thanks to the Model S.
No cruise control for Tesla. Shares of the electric car maker took off Tuesday, racing to a new high above $60 right out of the gate. But by late morning, the enthusiasm had chilled, and the stock was down about 3%. The supercharged moves come one day before Tesla (TSLA) is set to report its first quarterly profit ever. And it's all thanks to the all-electric Model S.
The full-size, four-door luxury sports sedan was unveiled in 2009, but didn't hit the dealerships until last year. And so far, sales have been nothing short of spectacular. Tesla CEO Elon Musk is also a big fan of social media, which helps draw attention from both investors and consumers. He loves to take to Twitter to make announcements and engage with fellow tweeters. @elonmusk has more than 195,000 followers. And that's probably why the stock pulled back. But back to Tesla as a company. It's worth keeping in mind that Tesla is still relatively young. It's been a public company for just shy of three years and trades at a pretty lofty valuation. Tesla is trading at nearly 50 times 2014 earnings projections. Compare that with other automakers. Ford (F) is just 8 times 2014 earnings forecast, while Honda (HMC) is trading at 11 times earnings and Toyota (TM) is at 13 times. Tesla shares have been on a roll. Click chart for more. There are still a lot of traders out there betting on the price going down (short interest is nearly 50%). And that can exaggerate moves. 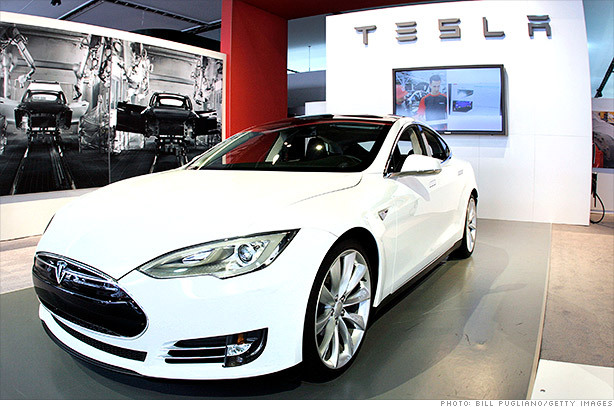 StockTwits traders took to the airwaves as anticipation for Tesla's results builds. I don't think you're alone here. And you might be right on the lotto ticket puts. I could see some selling ahead of earnings, which come out Wednesday evening. It will be interesting to see if Tesla lives up to the hype. Calling all shorts. Looks like they answered the call as the stock started to retreat. $TSLA. Sold all calls and keeping common in to ER. Made enough to PIF for my new Model S. Ordering today! Ha! Was he using GPS through Google (GOOG) Glass? It's no secret that the Google boys (Page and Sergey Brin) are big fans but a self-driving Tesla car might be a bit much. That's the $64,000 question isn't it? Well, stay tuned.